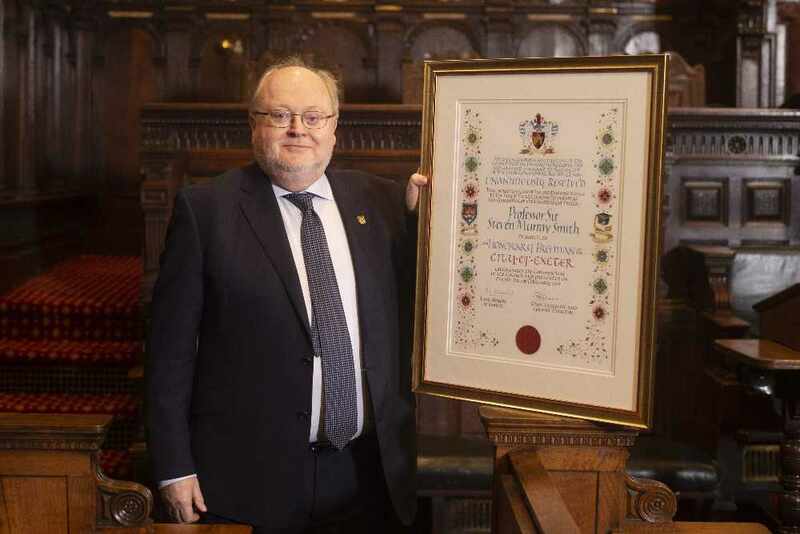 The Freeman of the City is an honour given to deserving people with a connection to Exeter. Other people to be given the title include Lord Nelson, athlete Jo Pavey, and also recently Dr Todd Gray an Honorary Research Fellow at the University of Exeter and leading historian on the area. Since October 2002, Professor Sir Steve Smith has led the University of Exeter so that it is now ranked in the top 15 universities in the UK and the top 150 in the world. Student numbers have nearly doubled and the financial turnover has increased nearly five-fold. Today, the University injects more than £1.17bn into the economy and generates over 11,000 jobs in the South West, including over 5000 jobs in Exeter itself. Professor Sir Steve Smith said on becoming Freeman of the City: “I accept this honour with humility and warmth. It means a lot to me to become a Freeman of this great City but I also accept it on behalf of all my colleagues at the University of Exeter. “Over the past 16 years a large number of staff in the university and the City Council have spent a lot of time building a supportive and productive relationship between the two organisations. The incredible success of the city in recent years owes a lot to a wide range of people, but a central role has been played by the way the university and City Council have worked together on education, on the economy, on arts and culture, and on planning.